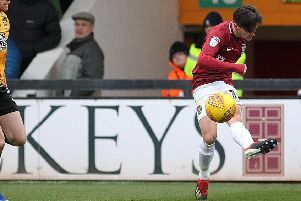 Cobblers boss Keith Curle says everybody at the club is ‘devastated’ by the news that defender Leon Barnett has been advised to retire from playing football due to a heart condition. The 32-year-old has been told by medical experts that it is too much of a risk for him to continue training and playing as a professional, and he has been forced to hang up his boots. The news was confirmed to the former Bury, Wigan Athletic and Norwich City man at the weekend, and he was at the PTS Academy on Saturday to inform his team-mates of the news. Barnett hasn’t played since suffering some issues in the 0-0 draw with Bury on October 2. That was Curle’s first match in charge of the club, and the Town boss said: “We are all devastated for Leon. “Leon had been having some issues but after a reaction in the Bury game we knew something wasn’t right, so we sent him for further testing. “The medical team made the correct decision to stop all activity, and after testing and second and third opinions, for his own health and safety, Leon has been advised to retire. “It is very sad news. Leon is not just a good player, but an important figure off the pitch too. Barnett has played in all four divisions of English football, playing in the Premier League for both West Bromwich Albion and Norwich City, and also played in the Europa League for the Latics. And Curle added: “Leon has enjoyed a fantastic career as a player, playing at all levels of the game to play over 350 senior games across the four divisions. Barnett is under contract to the club until next summer, and Curle has said he will be offered coaching opportunities over the coming months. Barnett also runs his own coaching school for youngsters, called the Leon Barnett Football Academy.